Ruff Night in Wine Country whimsical needlepoint by April Murphy from Maggie Co. with bright, fun colors. This hand-painted contemporary dog needlepoint design measures 14.5" x 7.5" on 18 mesh canvas. The design comes with or without fibers - your choice. If you select cotton we will send DMC cotton floss. For wool we will send Bella Lusso, and silk we use Planet Earth Pepperpot boutique fibers which is single-ply for 18 mesh. If you want to mount your canvas on stretcher bars to hold it taut while you stitch then we recommend purchasing a pair of 18" and a pair of 11" stretcher bars with thumb tacks. 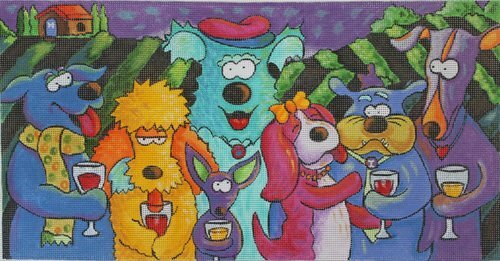 This Ruff Night in wine country handpainted needlepoint canvas usually ships within 1 week.